Offshore wind power seems to be on the cusp of taking off in the U.S. That’s great news for the climate, but every technology has a cost. As a new study points out, a surge in offshore wind could also mean a surge in our appetite for a rare earth metal that’s mined at a heavy environmental toll. 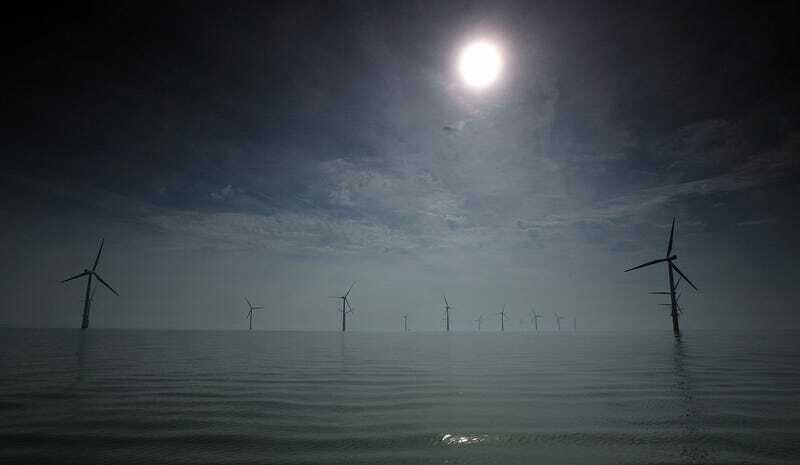 In fact, expanding U.S. offshore wind capacity in line with a recent Department of Energy report could require some 17,000 tons of the rare earth metal neodymium by 2050, according to the paper published recently in Nature Sustainability. This demand, equivalent to that of about 20 million hybrid and electric cars, is significant, and it could create supply challenges for the industry if we don’t begin developing alternative technologies and making rare earth magnets more reusable. Although the U.S. offshore wind industry is currently tiny (it consists of exactly five turbines off the coast of Rhode Island) there are signs it could start expanding in a big way. A number of states on the Eastern seaboard have committed to ambitious offshore wind targets, and in December, the Trump administration held a record-breaking offshore wind lease sale, highlighting a strong appetite for new projects. As America’s offshore wind industry grows up, its appetite for rare earth metals is liable to grow in step. That’s because the larger turbines deployed offshore to harness stiff ocean breezes are increasingly using so called “direct drive” technology, which swaps the rotating gearboxes typical of smaller, land-based turbines with a generator composed of a ring of neodymium-iron-boron magnets. These are similar to the rare earth magnets found in your smartphone, except super sized: Where a phone might use a few grams of rare earths, turbines can use around a ton each. “Which is obviously a lot,” Fishman said. In their paper, Fishman and co-author Thomas Graedel worked out the neodymium required to deploy a fleet of these direct drive turbines in line with the DOE’s 2015 Wind Vision Report, which calls for building 80 gigawatts of offshore wind power by 2050. The researchers found that the industry’s rare earth demand will rise from about 1,200 tons a year in 2020 to nearly 3,000 tons per year by mid-century. Now, these aren’t pie-in-the-sky amounts: Global production of neodymium is nearing 30,000 tons a year, Reuters reported in 2018. But the U.S. isn’t the only country building up its offshore wind capacity, nor is offshore wind the only clean tech industry reliant on these metals. To avoid unexpected supply shortages as the industry grows, Fishman suggested the U.S. could invest in restarting its shuttered rare earth mining industry. That might pay dividends in terms of avoiding environmental and human rights abuses, too. Today’s rare earth production is centered mainly in China, where lax oversight raises concerns about high levels of pollution from mishandling of the toxic waste produced during mining and processing, as well as child labor exploitation. We should also invest in replacement technologies, Fishman said. On that front, the DOE has been busy. This week, researchers with the department’s Critical Materials Institute presented early results of an effort to replace neodymium-based rare earth magnets with other recipes at the annual American Chemical Society’s spring meeting. CMI’s Thomas Lograsso, who’s spearheading that effort, told Earther via phone that one promising approach seems to be swapping neodymium for the more abundant rare earth metal cerium in combination with cobalt. Lograsso said replacement magnets are probably “years not decades” away from some commercial applications, while emphasizing that there’s no panacea and different applications will require different solutions. For now, if you’re looking for an extremely powerful magnet to, say, spin a giant turbine, the neodymium-iron-boron recipe remains your best bet. “Ideally, we’d love to find the next great powerful magnet that absolutely replaces neodymium-iron-boron, but.. it’s a tall challenge,” Lograsso said. Fishman said the wind industry can also work to standardize production of rare earth magnets so that the long-lived components can be swapped from old turbines into new ones. The study is another reminder that even as the world switches away from dirty, extractive fuels, our reliance on extractive industries to build the high-tech energy infrastructure of tomorrow will continue. Planning for the rare metals challenges to come, from magnets in turbines to lithium and cobalt in EV batteries, should help to minimize the environmental and human toll these industries take as they become ever more crucial.